STAFF at one of the UK’s most famous sports grounds are celebrating after scooping another top accolade. Everton FC’s hospitality experts are toasting their success after the ground was named Sports Hospitality Venue of the Year 2016 at the Downtown in Business Work Hard, Play Hard awards. Goodison Park beat off major rival Liverpool FC as well as Chester Racecourse, Aintree Racecourse and Formby Golf Course to lift the title last night (September 15). The Work Hard, Play Hard awards are organised annually by Downtown in Business, one of the North West’s leading business organisations . They celebrate the businesses, people and venues which have helped make Liverpool’s visitor economy with £3.8billion. Everton FC’s events and conferencing is managed by Sodexo Prestige Venues & Events, and a group from the stadium received their prize at an awards ceremony at Liverpool’s Hilton Hotel, attended by more than 200 businesses. Debbie Slee, sales and marketing manager for Sodexo Prestige Venues & Events at Everton Football Club, said: “This is another fantastic achievement for all of the team at Everton FC, and follows a very successful year for us. In June, Gareth Billington, Sodexo Sports & Leisure executive head chef at Goodison Park, won the People’s Choice award in the Craft Guild of Chefs awards, which acknowledge the crème de la crème of the industry. 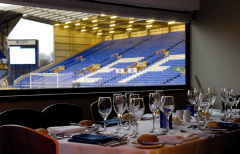 For further information about Sodexo Prestige at Goodison Park, call 0151 5305250 or email events@evertonfc.com.